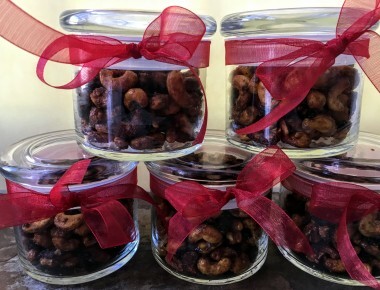 If, like me, you are running late, but still hoping to make edible gifts for this holiday season, consider these delicious curried cashews with currants. They take only about 30 minutes to assemble, roast, and cool! I included these nuts at a Holiday Open House cooking class last week, and was thrilled when almost everyone in the packed room said they were planning to prepare them! These nuts are definitely addictive. Just try eating a mere handful! Seasoned with a tempting blend of both sweet and salty notes, cashews, along with currants, are coated with a maple syrup mixture scented with curry, cardamom, and ginger. The nuts are roasted quickly (in less than 15 minutes) until golden brown, and then cooled until crispy. In fact, these cashews actually improve in flavor when prepared a day or two ahead. Give them to friends, to neighbors, to teachers, to the newspaper delivery person, to your hairdresser, to your exercise trainer, to anyone to whom you’d like to say special thanks during this season of giving. 1. Arrange a rack in the middle of the oven and preheat oven to 350 degrees F. Line a rimmed baking sheet with parchment paper cut to fit the pan. 2. In a large skillet over medium heat, whisk together the maple syrup, canola oil, curry powder, brown sugar, ginger, cardamom, and kosher salt. Stir well to blend, about 1 minute. (The mixture will be a rich caramel color.) Then using a wooden spoon, add the cashews to the pan and stir until coated well. Remove from the heat and stir in the currants. 3. Spread the nut mixture on the baking sheet in an even layer. Sprinkle with sea salt and roast for 5 minutes. Then stir the nuts with a metal spatula to coat them with any liquid on the bottom of the pan. Cook 5 minutes more, and stir again with a metal spatula, coating with any liquid in the pan. Cook 2 to 3 minutes more or longer (watching carefully so cashews do not burn) until nuts are golden brown. Remove and stir again. Cool to room temperature. 4. Use your fingers to break up any cashews that are stuck together. Store in an airtight container at room temperature for up to 2 weeks. This entry was posted in Food News and tagged cashews, curry, gifts, holiday, spices by brosbottom. Bookmark the permalink. Hi—I’m Marisa, we knew each other in Columbus. Thank you for this recipe. I found that the raw cashews were not quite roasted enough for my liking after following your instructions to the “t”, and am wondering if roasting them for 10 minutes before adding the syrup may be a way to consider? Thanks. Hope you and Ron are enjoying the best of the holidays. You could pre-roast them at 350 for 6 to 8 minutes and then do the recipe. But because the nuts are roasted at 350 degrees instead of a more typical lower temp, you’ll need to watch them carefully so that they don’t burn if you pre-roast them. I would suggest that you simply add extra time to the roasting in the original recipe, checking the nuts every 2 to 3 minutes after the first 10 minutes to make certain they are not burning, until they are browned the way you’d like. For the nuts you have already done, you could put them back on a baking sheet in a 350 oven and check them every 2 to 3 min until they are the color you want. Thank you, Betty, for these suggestions. I did add about 10 minutes to the roasting time and that was a decided improvement. They were a bit sticky but so delicious! a similar issue. All best to you for the holidays! 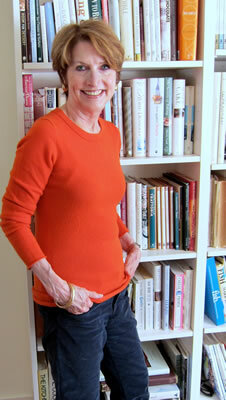 Betty, I recieved your cookbook Soup Nights as a holiday gift. I attempted to make the Chicken Noodle Soup with sauteed mushrooms and parm (page 77/78). The second page of instruction is just a repeat of the two beginning paragraphs. There is no instruction for the last 5 ingredients. Puzzled what to do with the flour and half/half. Please clarify. Bad editing. the recipe onto the second page). Here is a link with the correct recipe. That chicken noodle soup is one of my favorites–great and warming in this cold weather. Thank you, Betty. Yes, it is one of the best chicken noodle recipes I have tried. I will print out the corrected recipe and put it in the cookbook. Thank you so much, Rhonda! I’m so thrilled you liked it and hope you’ll enjoy this chicken noodle soup during this extra cold winter.